I recently attended the 2015 Cleveland American Marketing Association Market Research Conference and loved. Every. Single. Minute. While the event featured several industry experts in the field of market research, I was especially impressed with the insights shared by David Harris, a leader in questionnaire design and qualitative research. He authored The Complete Guide to Writing Questionnaires: How to Get Better Information for Better Decisions. Like Harris, I believe that questionnaire design should be taken more seriously. It is a critical component in the earliest stages of understanding a specific audience segment that will eventually inform the development of a marketing program. Too often, questionnaires are written with good intentions but include questions that are unclear, unanswerable, more difficult than they need to be and biased. Why should we care if a questionnaire isn’t as well written as it could be? A poorly constructed questionnaire can introduce measurement error or inaccurately assess what it’s intended to explore. This means the results cannot be trusted or held as a precise representation of the audience being evaluated. This can lead to misunderstanding, poor decision-making, inaccurate marketing initiatives as well as wasted time and money. Questionnaire writing is arguably one of the most difficult forms of writing. Harris described it as a “conversation between you and hundreds, and sometimes even thousands, of diverse respondents.” The difficulty falls in that each question has to be written so that every one of the diverse respondents understands the question the same way (talk about overwhelming!). Further, unlike a live, face-to-face conversation, you are not there physically to clarify ambiguities. 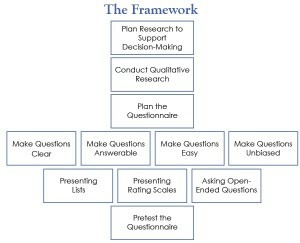 To ensure successful questionnaire development, Harris created the following framework that contains guidelines to make questions clear, answerable, easy and unbiased. 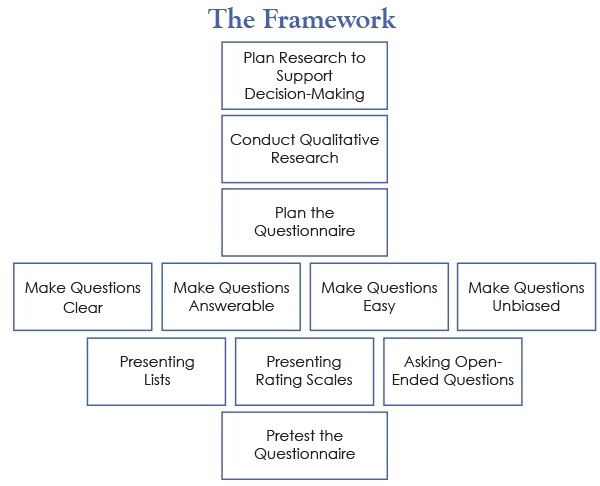 As a member of Point To Point’s B2B customer engagement research team, this framework has served as a reliable filter through which we run our questionnaires, ensuring that our thoughtful approach to understanding the deep inner-workings of various audience segments is spot on.